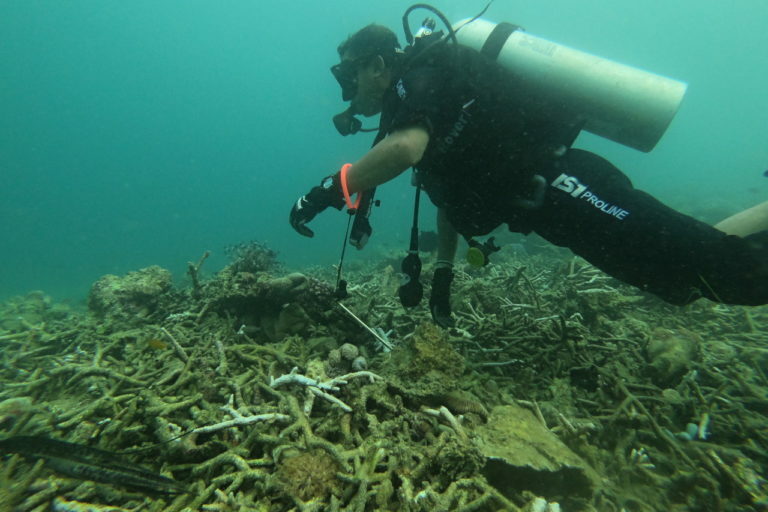 The earthquake and tsunami that hit Palu last year devastated the coral reefs off coast of the Indonesian city. Researchers have expressed concern that waste and sediment from sand and rock mining operations along the Palu Bay could prevent the coral from growing back. Local officials say more action is needed to restore the coral in the bay. PALU, Indonesia — Few people knew about the luscious coral off Palu, in Indonesia’s Central Sulwaesi province, before an earthquake turned it into an underwater wasteland. “You didn’t even need to go to Raja Ampat to see coral this beautiful,” says Iksam Djorimi, referring to what’s widely regarded as Indonesia’s most hallowed dive site. Before the quake, Iksam, an archaeologist at the province-run Central Sulawesi Museum here in this eastern Indonesian city, would often dive in Palu’s narrow, horseshoe-like bay. He had little company; only one dive resort brought customers to the reefs here, though a tour guide Iksam knew at the better-known Bunaken dive site in neighboring North Sulawesi province had also planned to take a group to Palu’s reefs. The coral also supported the fish that helped sustain the economy in this region of nearly 1 million people. Then the Palu-Koro fault shook. More than 4,400 people died in last September’s magnitude-7.5 earthquake that simultaneously triggered tsunamis, landslides and nightmarish liquefaction, where moist soil turns into quicksand, swallowing up houses, cars and people. Hundreds of thousands of people were displaced, and the government estimates rebuilding will cost $2.6 billion. Several thousand people in fishing families lost not only their homes to the tsunami, but also the boats and equipment on which their livelihoods depended. Now, it seems they’ve lost a critical link in their food chain. A few days after the quake, experts speculated that Palu’s reefs had suffered “tremendous damage.” Iksam had a chance to see for himself when he swam down to some of his usual spots in the bay in March. “I was devastated because within just those few minutes everything was gone,” he says. Iksam swims amid the damaged coral months after the quake struck. Image courtesy of Iksam. Palu’s coral has been a critical ecosystem sustaining fish populations, not to mention a potential tourist draw. But having already suffered the impacts of decades of blast fishing, where explosives are used to stun fish for easy collection, the coral may struggle to make a comeback. Sand and rock mining along the bay’s western coast over the past 10 years has also sent an influx of sediment into the bay, covering the ocean floor and coral. 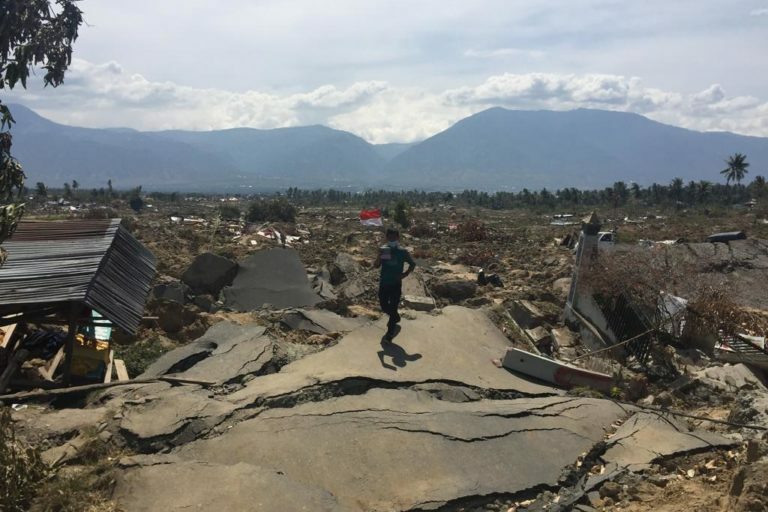 “Even before the earthquake the bay had experienced heavy damage,” says Nasrun, the ombudsman, or public advocate, of Central Sulawesi. At least 53 mining companies have operated in the vicinity of the bay in the past decade, according to a 2017 report from Nasrun’s office that urged the provincial government to suspend all environmental permits for the mining companies, to no avail. Now that waste and sediment, researchers say, may prevent coral from growing back. A man holds up the Indonesian flag amid the wreckage from the quake. Image courtesy of the EU Civil Protection and Humanitarian Aid Operations/Flickr. The Palu-Koro fault stretches south down Palu Bay, through the city and into the mountains. Four months after the quake, geologists found that the fault had moved at speeds equivalent to a sonic boom, up to almost three times the speed of a normal earthquake in what’s known as a rare “supershear” event. Supersonic speeds can amplify an earthquake’s destructive impacts, and in Palu, that meant ground turning to liquid, tsunami waves washing ashore minutes later, and underwater landslides that leveled the ocean floor. The ground-rupturing decimation interrupted lives as well as government projects years in the making. Some agencies had been looking at ways to address the impact of mining on the coral. One of them was the provincial fisheries office, where Edward Yusuf is a spatial manager. In addition to sending sediment into the ocean, Yusuf says, each mine has its own port to ship away the rocks and sand it digs up. This maximizes pollution from leakage into the water of equipment waste. To address this, the fisheries office drew up a plan to create a single port for all the mines to use. The project was just one of many long-term initiatives that will have to be restarted from the beginning in light of the quake. Yusuf’s team hasn’t gotten funding to check all the rehabilitation sites, but he expects that the progress made has been lost. Before the earthquake, Yusuf was waiting for responses from various government bodies to his request to designate fishing areas and protected areas from mining and overfishing. 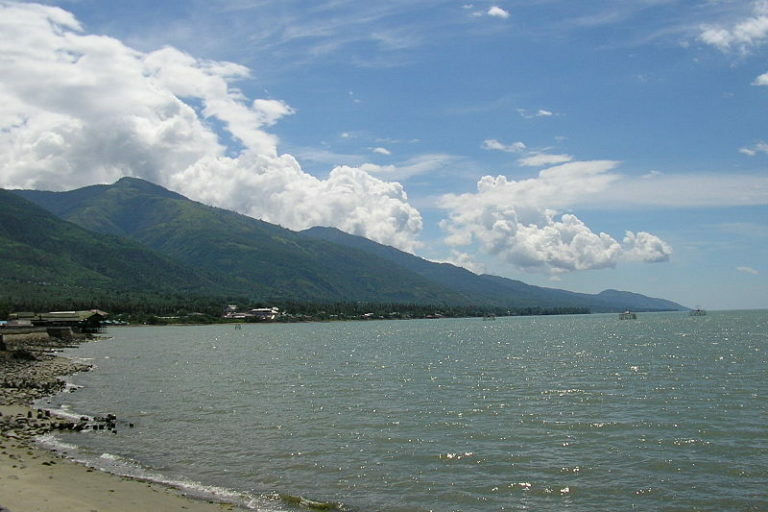 The Palu Bay, before the quake. Image by a_rabin/Wikimedia Commons. Without boats, most fishermen across the earthquake-struck area have yet to return to sea, and government aid for fishermen has been slow. At least for the moment, there is little pressure on the fish that have lost their habitat. The central government is planning to create entirely new parts of the city for residents who saw their houses turned to rubble by the tsunami or liquefaction. Development, according to Palu’s infrastructure recovery leader, Arie Setiadi Moerwanto, will try to listen to nature this time. Residents will not be allowed to live in red zones along certain coastlines, liquefaction-prone areas, and the Palu-Koro fault itself. A strip of land 20 meters (66 feet) wide, likely green with rice paddy and other farms, will be blocked off to buildings, stretching from the coastline into the mountains. Iksam has been an archaeologist for years, but diving is a recent hobby. When he saw the destruction from the earthquake, he took advantage of what he knew to help out. 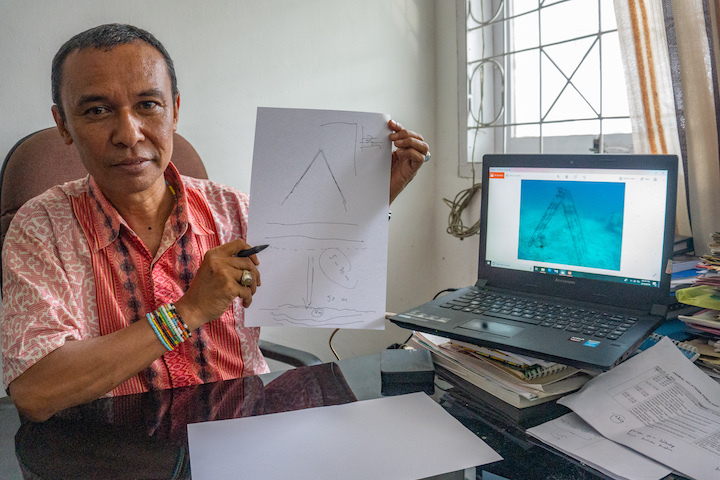 He found abandoned metal trash and constructed a structure underwater to promote underwater growth and build a fish home, taking inspiration from the simple triangle shape of Central Sulawesi’s traditional homes. Iksam at his office at the Central Sulawesi Museum. Image by Ian Morse for Mongabay. 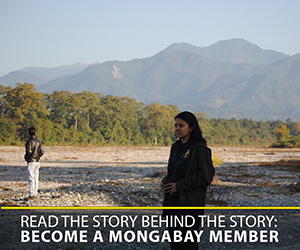 Even before the quake, Yusuf saw the push to conserve the bay as a battle between nature and development. At this point, no research has been conducted into the quake’s impact on fish, according to local researchers. But with many fishermen unable to go back out to sea, those who can are catching not just more fish, but bigger ones. When fishing resumes on a wider scale, he says, that will likely put more pressure on the remaining fish that have lost their habitat. Yet at the bottom of the food chain, coral will face greater pressure. Tantu says he believes the earthquake has fundamentally altered the ecology of the bay. While the government has placed a $2.6 billion tag on recovery efforts from the disaster, the fisheries office hasn’t yet calculated how much conservation will cost. Djorimi says more action is needed. Banner: Fish and corals in Bunaken, North Sulawesi. Image by Matt Kiefer/Flickr.